Hi Everyone My namie is Martin. I'm same big maniac of Roller Coasters like You. I: rally glad, that in Poland We have Theme Park. Previously, for many years there have been unsuccessful attempts to build such a park in our country. Now it"s a fact. I'm glad that people from all over the world noticed Energylandia and more. We are connected by amazing adventures and impressions connected with Roler Coaster. It's Just fantastic, and brakes off while riding on Rolller Coasters. By the way. I made this fake photo of Zadra, in part for imagining how it will be, but also for humor to make it fun. But serioussly it's very difficulty is to make a full photomontage, because Wooden Coaster construction has many wood boards and it's tiring for your eyesight. I did same with The Hyperion. That construcion was much easier for photomontage. Best regards for everybody and have fun. Serena, EpochEmu, Yoris Kerkhoff and 10 others like this. Hey Martin! I'm really glad that the Poles and Slovaks are getting access to world class coasters too! oriolat2, Coaster Hipster, pawel98123 and 6 others like this. Very early for track pieces. Wow! I love the color of those rails! EpochEmu and Lofty like this. 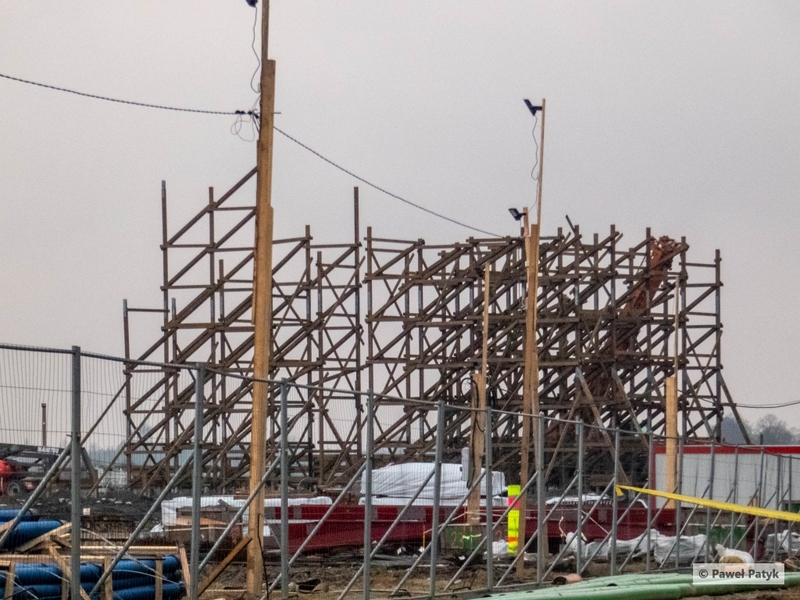 Track for a new coaster on site where they're building said new coaster? And painted in the same colours as every other RMC track? Incredible. I think this project is really exciting, but this is not one of those moments. Yeah, ATI is right, they're literally just the normal red colour..? Surely it doesn't matter whether or not the colour has been used before? He likes the colour, fair play. I happen to like the colour too, both these rails and rails on existing RMCs. Howie, Pear and bernatc22 like this. Well, you know the rails aren't going to look like wood, so there's no attempt to hide it. You want it to stand out and have the rails be visible, especially among the wood structure. What color besides red doesn't look tacky? Purple? Green? Blue? Red!!! Although, personally, think gold, silver, grey, black, white, or cream rails would be cool. What color besides red doesn't look tacky? Purple? Green? Blue? Red!!! Although, personally, think gold, silver, grey, black, white, or cream rails would be cool. Depends on what colour the structure is tbh. Blue looks good on white wood but I imagine it wouldn't look amazing on brown wood because it would be a cold colour on a warm colour. Considering the colour of Zadra's structure, I'd say red was the best choice, with brown/bronze being other suitable options. Coaster Hipster and Hixee like this. I’d love to see a Yellow RMC! Zek_Teh_Kek, Serena, Slamming Coastercore and 7 others like this. White, like black, looks great with any color. The blue rails look particularly striking on Twisted Cyclone and Twisted Colossus, but green also looks great and I imagine red would too. I agree, the white support color combos are great! And I think he means yellow RMC hybrid, which would looks sweet! If I was to be pedantic, the Raptors have wooden catwalks on their brake runs so I guess they are kinda hybrids but that's really pushing it. The materials used when we talk about coasters being wood/steel/hybrid are really only related to primary structure and load bearing portion of track*. Catwalks, along with station buildings and tunnel are just functional accessories. If the track and supports are steel, then it's a steel coaster. *I add that "load bearing" bit to try to head off the next post of pedantry reminding me that the wheels on woodies run on steel strips. This is correct, but that steel isn't supporting any of the weight of the train - it's simply to stop the wood being cut to shreds. It's the laminated wood that is actually doing the work. Benenen, Hutch, Antinos and 1 other person like this.